The companies have to operate a number of departments due to their large-scale operations. The department of training is also an important part in many companies as they have to hire new talent every month and offer training to the. This is what can help the company in routine operations majorly. From just hiring to the appraisal of all the functions are much required. Thus, offering maximum satisfaction of the employees in the long run and creates a power-packed workforce. Remote Proctoring Service can be stated to be a technology that assists in remote appraisals. Hence, giving credibility to online assessment in education. It makes a feature that permits companies to administer an exam from any place wherever the contender has got very high-speed internet and a computer. Supervising through a blend of technologies like video images and monitoring software’s and keeps the contender away from any kind of prohibited activities. The online exam proctoring or virtual proctor is usually referred to as remote proctoring. This came up as a response to very much rising need of exam and training course by companies and learners present in distant areas. And after that, making an evaluation of the answer sheets to finally announce results, hire candidates, and others are now no longer in trend. Notions and technologies have altogether changed the whole of the procedure into a superbly crafted, less burdensome online method of proctoring. At present, the companies who are into remote proctoring service or online proctoring are adopting the latest process of administering exams. Thereby, providing the employees or contenders exams or questions for the suitable job roles in their organizations. The contenders appearing in the exam on any online forum are scrutinized by a live proctor all through the period of the test. These proctors are in a position to close down the test in case they discover the candidate involved in any kind of doubtful activities like cheating. The more screens a person needs to scrutinize the fewer exams she or he will be capable of proctoring. Just as the name signifies this type of proctoring records the information like logs and images for the proctor so that the proctor can review afterward. With the help of this system, numerous tests can be conducted at the same time dissimilar to live proctoring that has its own limitations. The proctor has not got too much role and is not required to supervise the whole process of the examination sitting before the screen. However, the job is transferred to the software precisely the (remote proctoring software) which takes note of contender’s activities. This automated system gets activated if there is a fraud or deception and the proctor will afterward review the event and make a decision accordingly. These exam assessment models make a measurement of a contender for hiring very simple and accurate. Hence, making the companies to trust this measurement process tremendously. Development in technology has resulted in secure measurement delivery. It is necessary to take a look at the facets that render them very sophisticated and advanced. This comes in force before the examination commences, the candidate requires authenticating that he or she is the person who was to sit in the assessment test. This is done by utilizing the IP, bio-metric, OTP. With the purpose of the registration to be successful, the contender requires passing the ID authentication process. Also a snapshot of face is taken to confirm the candidate’s facial recognition and ID proof. This makes the process complete, making certain that the person who is sitting in the exam is the one who registered initially. When enabled, this facet detects and shuts down the exam for the contender who lands on some added tabs and browses away ignoring the test window. The proctor is able to stop and shut down the test. Copy and paste is not allowed to put the bar to leakage of the content. There are also behavioral alerts; in case the contender is observed doing doubtful activities such as cheating, red-flags will be raised by way of alerts. It contains two parts one is meant for the Proctor and the other for the contender. The contender’s report encloses the whole of the general summary of his or her performance. Then, together with the percentile and percentage plus a sectional summary along with the percentiles and correct or incorrect attempts. The proctor’s report relating to the contenders is twofold - offline and online. The online report has several extra sections in addition to those found in the contender’s report that is hard level analysis founded on the skills and assessment. It as well encloses a section of the meticulous question-wise analysis. This section as well contains the live video recording of the exam process. The offline report is merely the downloaded version pertaining to the online report. Here in place of the video the pictures of the contender are caught. With cost associated with quality, the more a company invests in a product like this the better features it will offer. Likewise, a recorded video relating to the whole of the exam process is the luxury thing that demands more cost. It offers the proctor with a recorded video related to the activities of the contender throughout the course of the test or exam. As well, having red flags raised when the contender appears to be deviating from the screen. 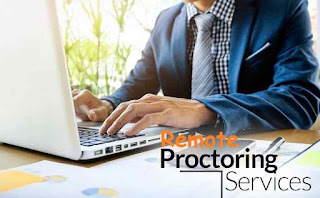 Remote proctoring service happens to be a two-faced affair wherein you have the proctor on one side and the contender on the other. This is an important relationship, the proctor can supervise on average five to ten contenders, and there are no issues of distance when the internet connectivity is high-speed. More and more companies are taking up this mode of invigilation to have better hire for their company. So make haste and take advantage of this today to enjoy the best AI based Online Remote Proctoring Services in Online Assessment Platforms. Chief Editor of ElochiBlog; Best Blogging and Technology Arena! Allen Elochukwu is a Passionate Blogger with full interest in making the world a better place for upcomming webmasters in the society at large. Connect with me on Facebook and Twitter.